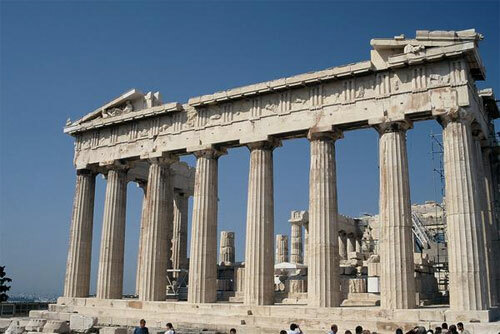 The Parthenon-the temple of goddess Athena is a masterpiece of architectural beauty. This was a rebuilt version of an earlier one, to celebrate the victory of the Athenians over the Persian conquerors! It proclaimed the greatness of the Athenian Empire. Even today, it remains unsurpassed by its originality. We haven’t exceeded the original design! Imagine! Words like democracy, freedom, philosophy, ethics, Olympic Games, a balanced life, objective, critical truth were all concepts without which we can’t live for a day! Prized possession! So, from then onwards I must have read and re- read this greatest of the Greek historians so many times. Much so was the number of books I must have studied about him. The Encyclopedia Britannica had two and half pages on him. Why Thucydides is so famous? He is the first historian who established what subsequent generations of historians call the art and science of history! He followed a refined style and intellect and examined the causes of war. The book, History of the Peloponnesian war, was written over many years, revised many times and the books end abruptly. 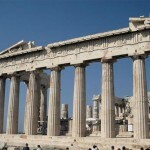 It covers the war that broke out between two great Athenian powers, Athens, the sea power, Sparta, the great land power. The war lasted 27 years; between 431 to 404. Why this history book is so great? It gives a more detached, insightful account. Then, it attributes the psychological causes. It draws lessons from war. Thucydides is the first historian who thought history has lessons for subsequent generations. There are views that history has no lessons. This is not so with this historian. He says in so beautiful language (the history is worth reading and should be prescribed in schools and colleges, certainly in the universities) the greed of men of power for more power leads to destructive consequences. There is one beautiful passage in the book. That is about the funeral speech of the greatest Athenian general and leader, Pericles. In his speech (it is this passage I heard from my English friends from by heart) says Pericles:”Our form of government does not enter into rivalry with the institutions of others. We don’t not copy our neighbors, but are an example to others. But while the law secures equal justice to all alike in their private disputes, the claim of excellence is also recognized; and when a citizen is in any way distinguished, he is preferred to the public service, not as a matter of privilege, but as the reward of merit. Neither poverty is a bar, but a man may benefit his country whatever be the obscurity of his condition. There is no exclusiveness in our public life, and in our private life we are not suspicious of one another. We alone regard a man who takes no interest in public affairs, not as a harmless but as a useless character. To sum up: I say that Athens is the school of Hellas.” Even today Pericles speech is moving and brings tears to our eyes, such is the power of the speech and nobility of the Greek spirit. There were other great historians. The one more famous name is Herodotus. The Colosseum, the awe-inspiring structure even in ruins. It stands at the centre of modern Rome, reminding us how great was Roman Empire’s achievements. Begun in 72 and completed in 80,it was the central stadium for sports and relaxation. The entire Roman world was dotted with such stadiums. Imagine! So many of our modern civilized life, the words like government, law, senate, republic, and stadium are all Roman contributions to mankind. He is considered the greatest of the English historians. Certainly greater than other popular writers like Macaulay and lately the much-hyped Churchill’s history of English people. Gibbon is in the class of great writers who had a vision and a concept of human progress.” he combined enormous erudition with the philosophical ideals of the Enlightenment” .His great work: The History of the Decline and Fall of the Roman Empire, presents a continuous narrative of the 2nd century Rome to the fall of the Constantinople in 1453.It is also considered a” masterpiece of prose style”. It is. I had enjoyed reading the passages, off and on, for the last several years, in so many editions and there are any number of editions fully illustrated with the great pictures of the Roman world, the great kings and the most, astounding buildings, the engineering marvels of the old world. If I were to go into this world of intellectual discovery and voyage it might sound too pretentious! Yes, I have over the years also developed so many of my very well thought-out views of what history and civilization is like for the mankind. One Indian writer who had studied much of Gibbon is the great Nirad Choudhury.He says that after the Roman civilization there is no civilization left to many to improve upon. While I don’t subscribe to much of Choudhury’s often prejudiced views, this one view, I am constrained to concede. Yes, the human achievements of the Roman civilization are so dazzling. No education would be complete, in my view, unless such an education doesn’t enable one to study and absorb the achievements of the Roman Empire. Yes, the Greeks were the real originators of all that is best in the man’s intellectual powers. But Rome is the world where we saw the full flowering of material wealth and material constructions, be it civil architecture or religious buildings, roads, the water carrying marvels, some of which are still in use. How can you die without exploring the Rome’s many marvelous buildings? Now, Gibbon (1737-1794) wrote his first volume in 1776 to much acclaim. Three more volumes were written, the last line was completed, as he himself says in the history, on June 27, 1787. He saw the long empire as a unity of great purpose and meaning. It grew on the foundations of undeviating ideals of political and intellectual freedoms that he found in the classical literature.” The material decay that inspired him in Rome was the effect and symbol of moral decadence”(Encyclopedia Britannica). In the end of the history, Gibbon says:” I have described the triumph of barbarism and religion, he reveals epigrammatically his view of the causes of the decay of the Greco-Roman world”. He was writing as a mid-18th century” philosopher”, Gibbon saw the process as retrogression, his judgment remains of perpetual interest.